Just a few images since I was too tired last night to mange to download photos. The day started out sunny, but I was feeling very confused. For the first time in 9 days of this tour, I woke up unsure of the time of departure. I had stayed up too late last night, writing after calling on Skype to relatives in the US – maybe I just lost my place. It’s hard to get my mind around being in Syria while talking to Chicago and New York. Nearly everything here is unfamiliar ( except for the hotel room and the bus) and getting used to that feeling is important. Talking to very familiar people, threw me back into my “other life”. Whatever the reason, I woke up this morning dis-oriented and anxious. Being late to the bus on a tour is a real faux pas, and I didn’t want that to happen. I was fine,actually, early to breakfast as it turned out.But it took hours to feel normal. 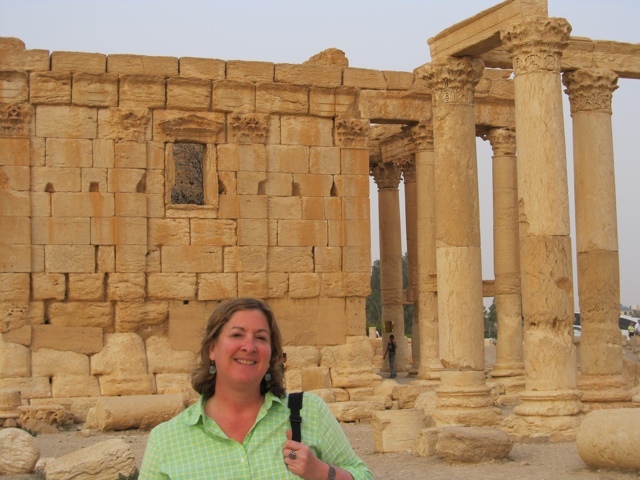 We left for the border with Lebanon, and then on to tour Baalbek. The process of leaving Syria requires attention to detail, and luckily our tour managers have that taken care of. We just had to patiently wait on the bus while they performed the rituals required. First fill out this form, then wait. then another, wait. Someone in a uniform boards the bus and looks at each passport and at each of us, nodding. We go. At the next border we got off the bus and hung out, eventually chatting with a friendly doctor from Tabriz on a tour of Syrian and Lebanon with his family. He spoke excellent english and expressed his desire to come to the US to further his medical education. When he left I looked into the windows of his tour bus and saw that all the women wore headscarves, all probably from Iran. We eventually got back on the bus and headed into Lebanon. One of the obvious differences was that Lebanon is a wine-grape growing country, and we were in wine country. Being from Northern California, I recognized vineyards all over the place – some long established, some newly planted. They were everywhere, in small plots and large fields. As we headed east, high snow capped mountains were in constant view across the flat plain of the Bekaa Valley. 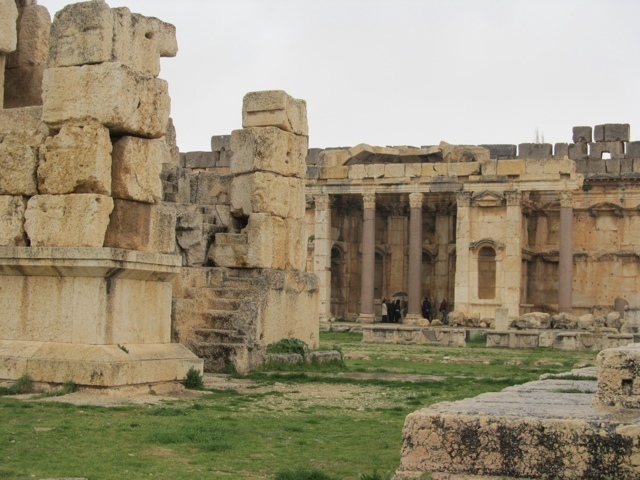 Baalbek, I think the city is called the same as the ruin but I’m not sure, is a busy city, even on a Sunday. In most of Syria, Sunday is the beginning of the work week, but this part of Lebanon is largely Christian, and most of the shops were closed as we drove through small towns on the way. Once we were near the main site, everything was open and the scene was bustling. We picked up a guide for the day, a young woman, as well as another man whose function was unclear. He led our troop through the streets to the restaurant where we had a delicious lunch before hitting the site, but then he disappeared until we were on the bus going to the border again. I think he helped in some way to get our visas approved, or our exit smoothed or maybe he just was a required commodity to make the day work more easily. This is the Middle East. We stopped first at a stone quarry to view a stone block, bigger than a city bus, that had been nearly completely cut out, but never quite finished. Impressive. I chatted with a women there who told me that her daughter lived in the Bahamas, was that near California? I explained the general arrangement of the oceans and the US. She asked how I liked Lebanon, and I explained that we were mostly touring Syria, just one day here. “Syria?” she asked incredulously. “Why go there, what is there to see?” clearly the idea of visiting the bad neighbor to the east seemed like a crazy idea to her ( and to much of the world right now. tourism is very low these days). 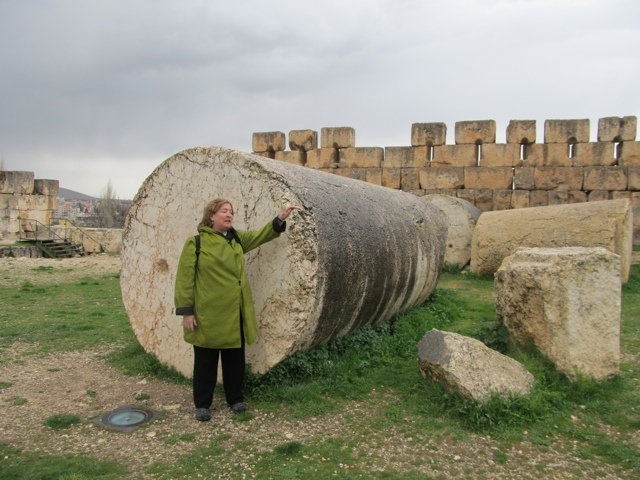 By the time we had finished lunch, on the 6th floor of a building with a view out to the ruins of Baalbek, clouds were darkening and the wind had picked up. One of the tour members and the local guide both announced that the weather forecast was for rain tomorrow,not today. They were wrong. First it was scattered drops, then harder. Then lighter, then thunder, heavier again. I had my hooded raincoat, but the temperature had also dropped and I was kind of cold. But, I’ve had worse experiences. Some people hadn’t worn rain worthy outer clothes and suffered much more. The guide was trying way too hard to impress us with her knowledge, but it seemed “canned” and not responsive to our kind of questions. Plus, we were all getting wet and cold, and she just kept talking! 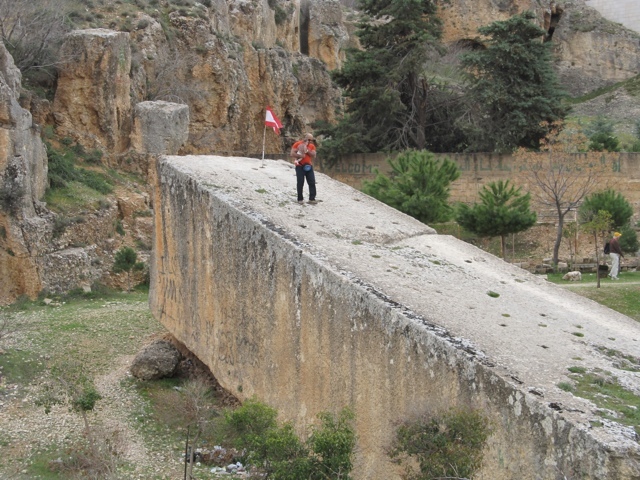 About 10 days ago, some of our group had been part of a tour to Lebanon, which had included a day at Baalbek. But, it had rained and so most of them chose to come again, in hopes of a better, dryer experience. No such luck. 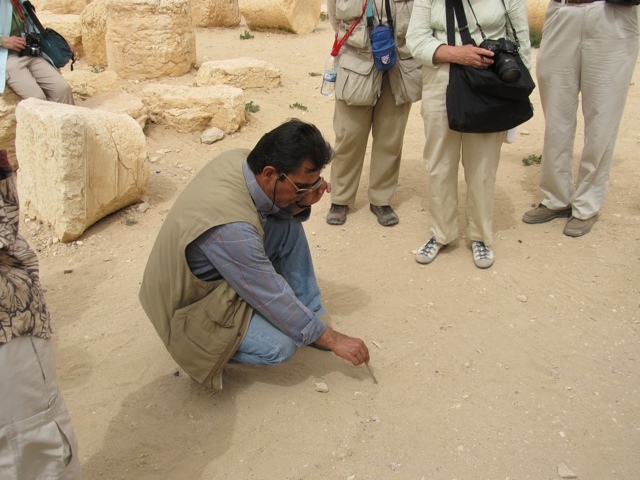 Was it simply a coincidence that two tour groups from the same company had rainy, miserable days in Baalbek? Was there some unseen force, some unaccepted deity controlling the experience? Had someone done something to anger Baal, the god of thunder and lightening and rain? This large temple complex was devoted to his worship, and his presence was still a factor in the behavior of many groups of rural people in the area, or so we were told. So, I suggested to a couple of my fellow tour participants that perhaps we should look into the behavior of the previous group, but another person said we should just go get a sheep and sacrifice it then and there and end our suffering. We continued to see all of the important parts of Baalbek, wet and cold. 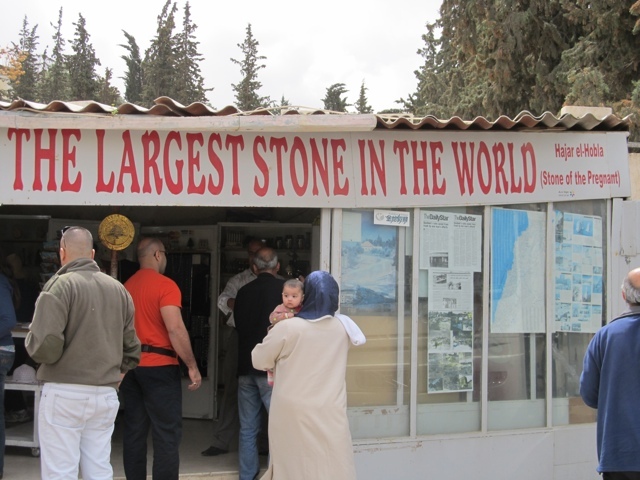 it is impressive, with some of the largest carved stone blocks that anyone has ever seen. On a sunny day, it must be wonderful. We did stop for a quick cup of hot tea before making the return trip out of Lebanon into Syria, with a quick stop at a real duty free shop where prices on wine and liquor were extremely low. Some of us had quite a bit of mediocre Lebanese red wine before and with our dinner. Apparently, we made the crossing in record time and were back at the hotel by 7pm. 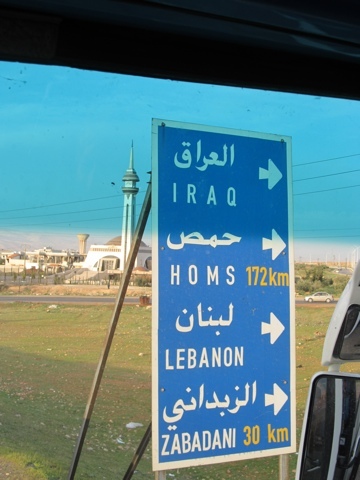 Tomorrow we will drive to Bosra,in southern Syria and end up in Amman one day early. If it were up to me, I’d be in Damasus for the day, visiting the souks and soaking up the atmosphere. I don’t think there is really any danger for the average tourist who stays “street smart” as one should do anywhere.But, the tour company is looking out for any potential for disaster, and so we are leaving. It’s been a fascinating 9 days. Palmyra. There are palms in the oasis, also pomegranate and some other tree, but we didn’t go into the area, apparently it’s all private property now. Strange, since it was clearly the oasis that allowed Palmyra to develop into the powerful city that it once was. 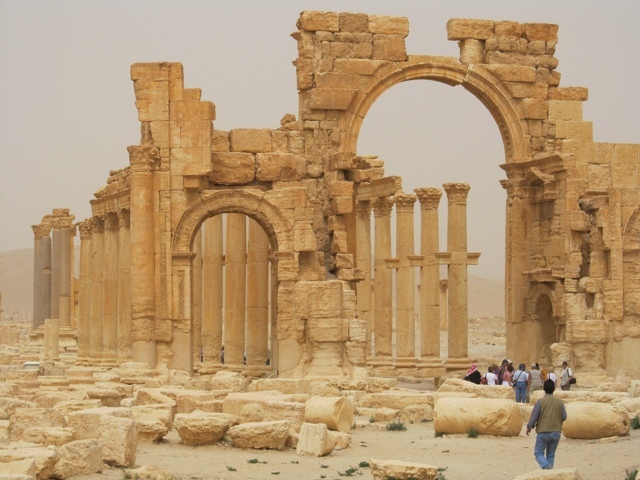 Out in the vast Syrian desert, Palmyra developed into a major crossroads for caravans carrying goods from east to west and north to south. The locals, the Palmarenes, created over several centuries from about 100 BC until its destruction in 272AD by Tamarlane a beautiful, orderly city that figured out how to shake down everyone who came through it. 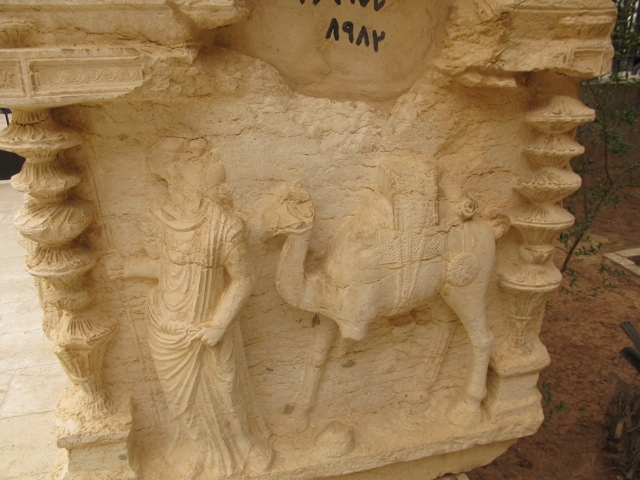 Caravans paid an entrance tax, paid to house the people and camels, bought and sold goods to each other, then paid an exit tax. The Palmarenes grew wealthy and built gorgeous temples to Baal and other lesser gods. 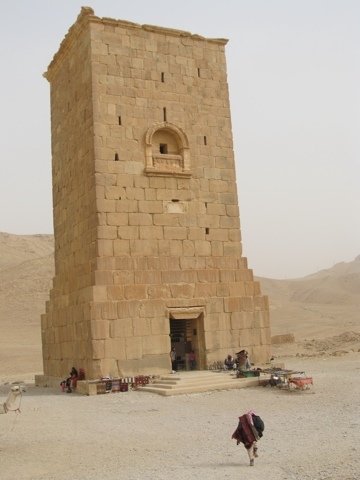 The very large Baal Temple had gold plated bronze column capitals, meant to shine out across the desert, a sort of “Come on by” advertising to attract those wanderers who might want to pay for an animal sacrifice to ensure their continued safe passage. The Temple was so large and had so many sacrifices that it had a special underground entrance for the animals, and a system of draining the blood away from the altar area through underground channels. And a big pool for water to wash up before and after the sacrifice. Up in the part of the Temple reserved for the most important priests, there was a life size statue of the good Baal, or Bel, in gold. He must have been fantastic to look at! Once a year he was brought out on a camel and paraded around for the common folk to see. These creative folks also built enormous tombs both above and below ground, to contain the remains of whole families. Not unlike what is seen in some famous cemeteries in New Orleans or Buenos Aires. They built storage shelves in the tomb, 4 or 5 high per floor in rows. The body went in and a carved bust of the dead person went on the front, sealing it and identifying it for all time. The tombs were elaborately decorated with sculptures of the main family members and gorgeous frescos on the ceilings. There is a lot to see here, and a lot of walking and standing and climbing up and down on high steps. In the heat and dust, it was exhausting. But, the day kept getting hotter and dustier. The level of particulates in the air would most likely have earned a “No Burn Day” designation back home, or a warning for people with respiratory issues in many places. We trudged on, there really was a lot to see, but the discomfort level got higher and higher. Most of us went through our water bottle before noon, and when a vendor with a cooler full of cold sodas and water bicycled past I, among many others, bought a drink. swarming vendor phenomenon.Palmyra is a very large site. perhaps half a mile on each side. Guys selling mostly junk ride around on motorcycles from one spot to another. There are also women vendors, but they seem to stay in one place, often with small children “helping” them. The guys are everywhere, and sometimes it gets funny as you keep encountering the same guys with the same stuff every time you leave one exit or another.Mostly they are really annoying. After lunch, we hopped back on the bus. Our tour company, responding to a message from the Consular Section of the US Embassy in Damascus suggesting that Americans currently in Syria consider leaving due to ” the potential for ongoing political and civil unrest”, decided to alter our tour a bit. Instead of spending the night in Hama, not far from the border with Lebanon, but the scene of some demonstrations recently, we are staying in a hotel on the outskirts of Damascus. Actually,it’s pretty far from Damascus,up on a mountain which is a summer resort for locals. We are the only guests here tonight, I’m quite sure. We are leaving Syria a day earlier than planned, too, spending an extra day in Jordan. Getting to the Damascus area was a 3 1/2 hour journey which included a dust storm. 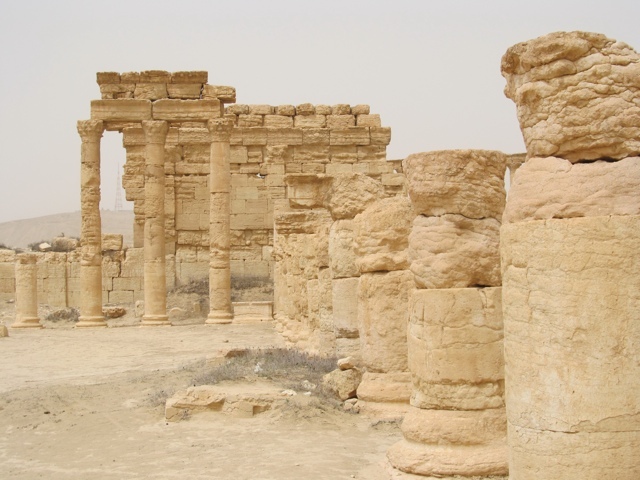 As we left Palmyra, the air got thicker and thicker, and windier and windier. Looking out the windows, you couldn’t see very far and cars and trucks had their headlights on.About half-way we stopped for tea and toilets at a really funny place called the Bagdad Cafe. It made me think of Wall Drug in South Dakota, just a little bit. It’s run by some Bedouins who have it full of all sorts of stuff, mostly junk from India, but some not so bad textiles. The guys running it speak excellent English and maybe are doing the “bedouin” thing just a bit more than is authentic. Maybe I’m just a skeptic. And they keep the toilets clean, gotta hand it to them for that. We got off the bus, only about 30 ft from the door to the “cafe”, but the dust got in under my contacts and I was nearly blinded. I had to take them out, one by one, and rinse them off. Not fun. Meanwhile, we eventually had to go out in that super windy dust again, to get back on the bus. Not fun again, but this time I wore my sunglasses and held my hands around the sides. Much better. 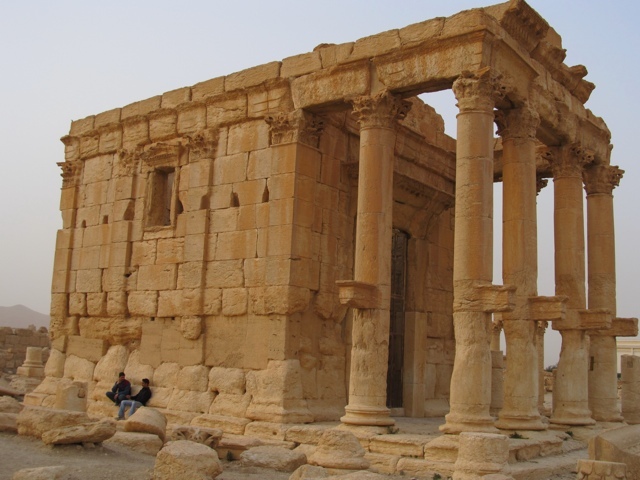 Back in the Damascus area, tomorrow morning at 7:30 we head to Lebanon,hope for an easy border crossing, and spend the day at Baalbek, another ancient city. Tell you more tomorrow. ps. I’ll put up more photos tomorrow too. After a loud night, I had a very dusty day. My hotel room was located on the river side of our last hotel – meaning that I had a view of the Euphrates River. Very exciting! But, after asking the hotel to unlock my windows since the air conditioning was not turned on yet ( heat and cool are determined by date,not temperature), I heard the happy sounds of a very loud wedding until about 3am. We first visited the ruins of Douro Europos, and then Mira. Both are sites of great historical significance. Douro Europos was the more interesting of the two, and had it’s own small museum. However, in both cases, the fascinating objects found at the sites have all been moved to museums in either Syria, France, England or Germany. What is left are the shells of the spaces, which require a lot of imagination! It wasn’t my best day, I’ll admit. It was pretty hot, 24-25C, and windy and as the day went on, increasingly dusty. By evening, we couldn’t even see the sunset. We are at Palmyra, however, and my excitement is growing. It’s a huge site, with lots of beautiful standing columns, a couple of churches and lots of space. This evening, a few of us sat on the terrace of a neighboring hotel, having a beer, waiting for the sunset. Young men on beautiful Arabian horses were racing back and forth, trying to get takers for a turn on their horses. And a camel or two were taking tourists for rides. Lots of tourists, despite the political turmoil, but nearly all are European- Germans, French,Dutch, and a few British tourists. This is the first place that has really felt like a tourist site, but then, so do some of the great places. I had an epiphany some years ago at Notre Dame in Paris – so many tourists so many people trying to sell you stuff. These places have been destinations for hundreds of years in many cases, pilgrimage spots in some cases. We are just modern pilgrims making our journey to what seems to be important, and bringing back evidence that we were there. I’m exhausted, and my bed is calling. Syria has a lot of desert, and even at the end of March, it’s hot in the sun. We left Aleppo, or Halep as it is actually called in Arabic and by the people who live there, bright and early and headed east towards the Euphrates River. The views out the window of the bus kept changing throughout the morning, first urban, then suburban then totally rural. Also changing was the physical character of the land we hurried past. It gradually became drier and drier. Small towns are fascinating to drive through.From the windows of the bus, up high, you look into all the shops along the main street. Bakeries with breads cooling on racks, green grocers with oranges, eggplants, greens and who knows what else, plumbing supply shops and endless numbers of car repair spots of all sorts. Body work, stuff requiring a lift, just plain mechanics – all the shops have men working in them, no women. Women are occasionally seen , usually older women, or else they are spotted hanging out the washing on lines on the roof. We passed many, maybe hundreds of nomadic, Berber, tents with women and children and lots and lots of sheep. Many of the gray, fabric tents had colorful laundry hanging from lines stretching out to the ground from the top of the tents. In the fields where no crops are growing, sheep are grazing. According to Walid, the farmers allow the sheep to graze and fertilize the fields naturally, then the planting cycle repeats on different fields. The nomadic Berbers have dropped in number in the last 20 years from more than 2 million to around 200,000 according to Walid. 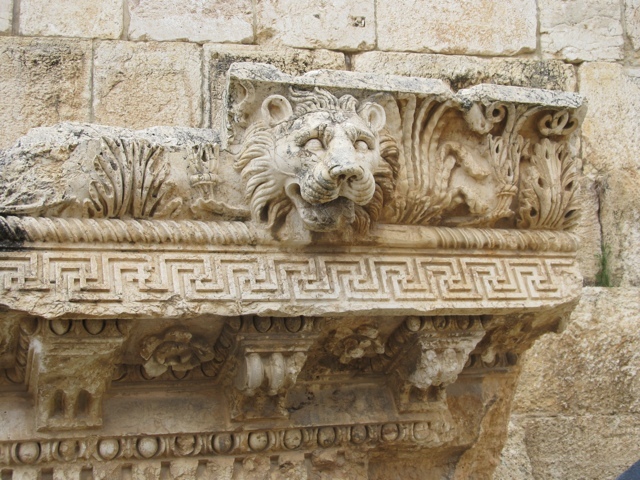 They represent a pastoral life that was a significant part of Syria’s, and most other middle-east countries history. Seeing the sheep grazing next to a tent, across the road from the Euphrates River must be a scene that was part of life for thousands of years. Now, newish concrete block houses in small villages sometimes have tents in the yard. It seems to me that the nomads are being encouraged to “settle” in villages, which will benefit the children in the long run as they will have schools to attend. It will change the pattern of life in the rural areas of course, but television, the internet and as Walid said, ice cream, are powerful attractions for young people. We arrived at Resafa, the ruin of a Byzantine era fortress complex, a distant outpost of the Roman empire. Resafa is built of the same dirt and sand as the desert all around it, and seems to rise up almost naturally from the ground. A long arcade forms what were interior walls on several sides, with a church or two included in the site. They built a system of gigantic cisterns, as deep as some London subway tunnels, which connected with incredibly long aqueducts which supplied the water to the storage areas. It was a beautiful and serene place. Lunch was a picnic of sorts in a decorated tent set nest to a small cafe that serves tourists to the site. Our driver, Hassan, had purchased a wide selection of savory pastries for us for lunch, my favorite was filled with chopped olives. We also had some delicious local halvah, a not too sweet dessert made with ground sesame seeds, and some fruit. On to Halabieh another fortress, but this time directly over-looking the Euphrates River. It was quite a drive from Resafa, but not far from our destination of Deir Ez-Zur. As we pulled up in front of the ruins atop a bluff, I knew right away that I finally had the time and motivation to do some drawings. So, I sat on a hunk of gypsum and pulled out my sketchbook. The site is very evocative, with a castle like nearly collapsed structure at the top of the hill and a barracks like structure below it. The barracks had some lovely arches near the top, and one side was cracking off and falling away. It was hot at first, and there were flies, but I kept at it. I don’t think that any of the results are very good, but it allowed me to focus on one thing for a while, rather than keeping up the frantic pace of the trip. Most of the group chose to hike up the steep hill to get into one or the other of the structures, but looking at them from nearer the river was very satisfying for me. Our next to last stop was to walk across the first suspension bridge built to cross the Euphrates River. I don’t know when it was built, but I can testify that it is a very popular place at sunset! Lots of people – families, young men (lots of young men!) some young women and kids were strolling over the river. It was a beautiful scene, and very friendly. Young girls stopped us to practice their English, and to have their photos taken. Finally, as it grew dark, we got to our hotel for the evening. It’s big, mid-90’s structure with little charm, and worse food. Dinner was pretty bad, but we were all so tired that it didn’t much matter. A huge wedding was about to start in the ballroom, Thursday being the eve of the weekend here. I only saw one young woman in a pale yellow dress with lace and sequins, and a matching head scarf. My room was stuffy, so before going to dinner I turned on the air conditioning, since the windows were locked shut. I came back to an oven! I called the desk and they sent a nice man with a key to unlock the windows. Apparently the a/c doesn’t go on yet, whatever the temperature. It is determined by the date. But, now I have two open windows facing the Euphrates and I can hear frogs and a cool breeze is coming through. Daylight savings starts here tonight, so we have even less sleep than usual. I’m off to bed, but first I must change my travel alarm clock! I’ve been waiting for Aleppo. So much of what I read about Syria revolves around the famous city. We arrived two nights ago, but yesterday we toured the north of the country, only walking into the Armenian Quarter near our hotel for dinner. Finally, we are spending the whole day here. Our first stop was the National Museum, a 1970 era building which houses artifacts from archaeological sites all over the country,some of which we have already seen. I’ve been to a lot of museums in a lot of places, but this really has a gorgeous collection of sculptures and fresco fragments from the ancient era as well as lovely pottery and metal work from the more recent Islamic period. We saw some of the cuneiform tablets recovered from the hoard at Ebla, and Joe Greene, the lecturer, explained that in some cases, the tablets need to be fired, very carefully, in order to restore them into readable condition. Originally, the tablets were simply allowed to dry, and stacked up. Un-fired clay is extremely brittle and fragile – I can’t imagine the skill needed to fire 3000 year old clay tablets with irreplaceable writing on them! The tension! There were large black basalt low-relief carvings that had once been on the outside of the temple at Ain Dara which we saw yesterday. And there were tiny ivory carvings that had once been inlaid into wooden furniture. After seeing the original sites where these objects were found, they were much more charged wit meaning than if I had not been to those places. I thoroughly enjoyed the visit. Next, we went to the Citadel, the highest point in Aleppo, built on top of the remains of other earlier inhabitants. It has all been excavated, according to Dr. Greene, and in fact we could look down into a current dig area being worked on by a German group. The Citadel is entered by a long stone stairway, through a arched gate, and up more stairs. From the ground I thought it looked like an awful effort, but it turned out not so bad. We continued to go up and up, stopping to see various spots of interest. A small mosque, a larger mosque, then a brief cup of tea on a terrace looking out over all of Aleppo. It’s an amazingly huge city, with something like 5 million people. It is ancient and modern all at once. The city was founded in the 2000 BC time, more or less and yet it continues to approach the modern world head on. Just a few years ago, the area around the Citadel was cleared of traffic and a large pedestrian area was built, with cafes and shops and a new hotel in an old building all facing out onto the plaza. In the late afternoon, hundreds of people were walking around the Plaza, or sitting in a cafe. I hope to go back there later this evening, but I’m pretty darn tired right now! Our touring is exhausting, with no down time all day from 8am – 5pm, except for lunch. Walking, standing, climbing up and down steep stairs and on and off a bus takes it’s toll on the old knees! Lunch is usually a welcome respite. Today,however, it was different. As we were walking through the Armenian Quarter to the restaurant picked for our lunch, the President of Syria was finally beginning to address the country. Everyone had been waiting for him to talk, every day it was delayed further. Then, it was supposed to be at noon, but noon came and went and there was not speech. Finally around 1pm, every shop had a TV blaring with the President’s speech. The sound of it echoed though the narrow streets, and with the exception of that, the city was unusually quiet. In the restaurant, we found a flat-screen TV mounted on a high wall, with the Speech turned on and the volume up high. The food was delicious, actually better than most of our meals. The restaurant finally got the idea that we, as foreign tourists, can’t eat fresh, uncooked vegetables – however delicious the presentations might be. We enjoyed our lunch, while the President talked, and talked, and talked. It was starting to feel like one of Castro’s endless talks, except that Bashir occasionally broke into a chuckle, a smile or a guffaw. Given that government troops have killed, according to non-government sources, dozens of civilians who have been non-violently protesting, it seemed rather odd and revealing of a disconnect with the “street” in Syria. The President’s speech went on for a good hour or more, then the screen showed individuals in the live audience, presumably government officials, began to stand and make short statements, apparently celebrating the good sense of the President. We watched as the other customers in the restaurant, and the staff, seemed to lose interest in what was being said. The man next to me, Glen Dash, who has spent a lot of time in Egypt, commented that it seemed that nothing was new, or people would have been reacting more clearly. After lunch, Walid agreed to talk about what he had heard, and it was not a happy talk. He said that promises were made to end the Emergency Laws, under which anyone can be arrested and held without trial, guarantees of a free press, and other controversial issues, but no time frame was mentioned. In other words, nothing will happen anytime soon from the government – what will happen out in the streets of Syria in the next few days and weeks is anyone’s guess. 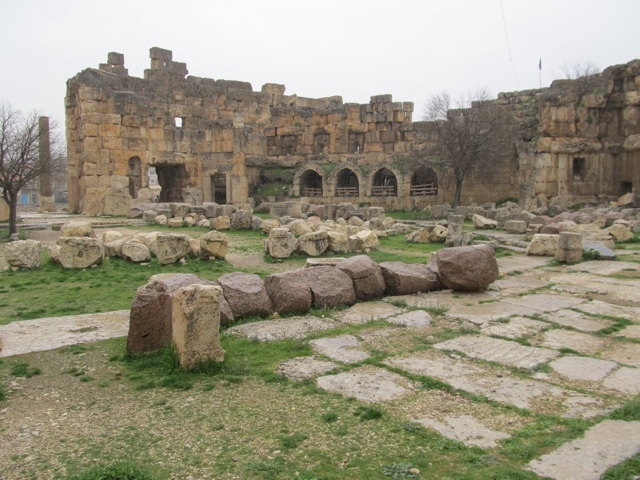 We leave Aleppo tomorrow morning, going to the Euphrates River to Deir Ez-zur to see the ruins of Resafa. What a strange day, starting with the excitement of hope – that finally the Syrian people would hear the news that they were expecting. We were all excited for them, happy to be here at a time of great change for the better. Hopes dashed are hard to see. As we left the restaurant, the area we walked through was quiet, dead. The sense of energy that we had felt 2 hours before was drained away in the long, odd speech of the President. We all felt subdued as well. Later we toured through the souks in the Old City, and I bought some interesting spices and a scarf ( I realized quickly that I had over-paid, but I like the colors!). Tonight we are on our own for dinner. Michele, a woman from Amhest Mass with whom I have become friendly, and I will dive back into the Armenian quarter in a few hours, when we are feeling hungry again. In the meantime, Salaam to all.